What is the sense you are getting about the elections in the state? Some members of her own party have levelled allegations of corruption against her. I think she is the first Rajasthan chief minister who has directly been accused of corruption. And there were more accusations from her own party members, including several ministers, than from the Congress. If you speak to some BJP leaders in private, they talk more about this than us. Even former BJP chief minister Bhairon Singh Shekhawat had announced a couple of months ago he would start a movement against corruption. If he says all this just before elections and add that corruption has increased a lot, whom do you think he is pointing towards? He said all this deliberately for the public to know how corrupt this government is. Is the infighting within the BJP going to hurt the party? Because of internal fighting, there has been no proper governance...not even one power project was started (in the past five years). The two that were completed were the ones started in my tenure (as chief minister). The government had to buy power worth Rs3,000 crore, according to official estimates, because the state didn’t get any power projects on time. All other schemes such as the Prime Minister’s Rozgar Yojana, the Mid-day Meal Scheme, National Rural Employment Guarantee Act (NREGA) are Central government schemes. The state government should tell us what they have done on their own. The Congress, in Rajasthan, is often accused of not playing the role of an opposition effectively. I would say the Congress culture is not like theirs (BJP’s) that includes stone-throwing, inciting violence, blocking roads and so on. The Congress, both inside and outside the assembly, talks with a certain dignity...they are the kinds who hit below the belt. So, I do admit that in terms of playing opposition, this difference does exist. Is it true that the active presence of Uttar Pradesh chief minister Mayawati’s BSP in Rajasthan this time is going to eat into theCongress’ vote share? No. In Uttar Pradesh, people decided that they had to remove Mulayam Singh Yadav (Samajwadi Party chief) and there is no point in (supporting) the Congress and the BJP since that would only mean wasting the vote. So Mayawati, who herself had not expected it, came to power. In Rajasthan also, people realize that there is no point in wasting votes (for the BSP). Do you think issues such as terrorism, inflation and economic slowdown matter in the elections here? No. Only local issues are important in the state elections. It is said that the implementation of NREGA, the United Progressive Alliance government’s flagship scheme, as well as the Right To Information (RTI) Act, was very effective in Rajasthan. Shouldn’t some credit for this go to the state government as well? Ours (the Congress under Gehlot was in power in the state from 1998 to 2003) was the first government in the country to have started this (RTI) Act. We respected the movement started by activist Aruna Roy and passed this Act. As for the good implementation of NREGA here, it is an illusion. Every state has a different culture. Different states will be ahead in different things. We look at it from the point that famines and droughts are a regular occurrence here, and the infrastructure we created to deal with them and how well we handled a bad famine when we were in power, are well known. What role will the youth play in this election? Wherever (Congress general secretary) Rahul Gandhi goes, young people are excited. This spontaneous response is a good sign. Do you believe the Congress’ policy of not projecting a chief ministerial candidate before the elections will harm its prospects? This question is meaningless. In my view, no political party has the right to declare its chief minister before the elections... I am amazed that everybody, from intellectuals to journalists, asks this question. It is often said that government employees were unhappy with you when you were in power and that is one lobby that would vote against you even now. Is it true? Not any longer. Now they are against them (Raje government) because the government didn’t implement the Sixth Pay Commission completely. How would you compare the BJP government under Bhairon Singh Shekhawat and the one under Vasundhara Raje? I have been a critic of both of them. However, despite being a critic of Bhaironji, we were on cordial terms. Can you see her with folded hands? 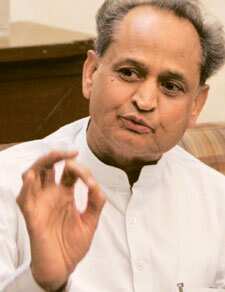 (Gehlot asks pointing to a BJP hoarding that showed Raje with folded hands). In reality, she is not like this. Bhairon Singhji, however, is like this...she (Raje) has called Shekhawat a purana khandahar (ancient ruin). But the party high command in Delhi must be happy with her to have given her so much importance. The (BJP) high command is not happy, it is helpless. They had internal fights for five years and the high command never intervened. (former BJP chief minister of Madhya Pradesh) Uma Bharti can be removed because she is from a backward community. But since she (Raje) is a queen, she has been given a free hand... nobody from the BJP in Delhi came here when people were killed in firing or when floods occurred. (Congress president) Sonia Gandhi, on the other hand, came here. How did this government handle the Gujjar agitation demanding scheduled tribes status? When the trouble started, she didn’t immediately hold dialogues with the leaders of the community. There are elections in six states right this year-end. Do you think the results would give us an idea of the national mood and what is to come in the Lok Sabha elections due next year?